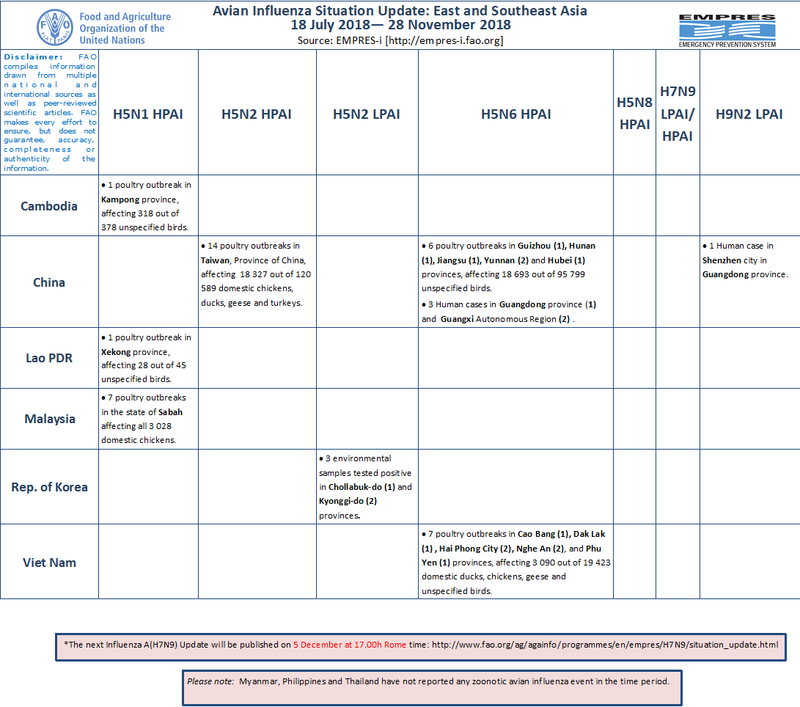 FAO/EMPRES-AH is constantly monitoring the avian influenza situation worldwide and compiles information from multiple national and international sources as well as peer-reviewed scientific articles. Close collaboration with country and regional offices, the implementation of avian influenza field surveillance projects and networks of expertise like the OIE/FAO OFFLU (www.offlu.net) provide access to timely information on outbreaks, surveillance findings and genetic similarities of circulating viruses or their virological features. This information is stored in the EMPRES Global Animal Disease Information System (EMPRES-i), a database that can be accessed online at empres-i.fao.org. 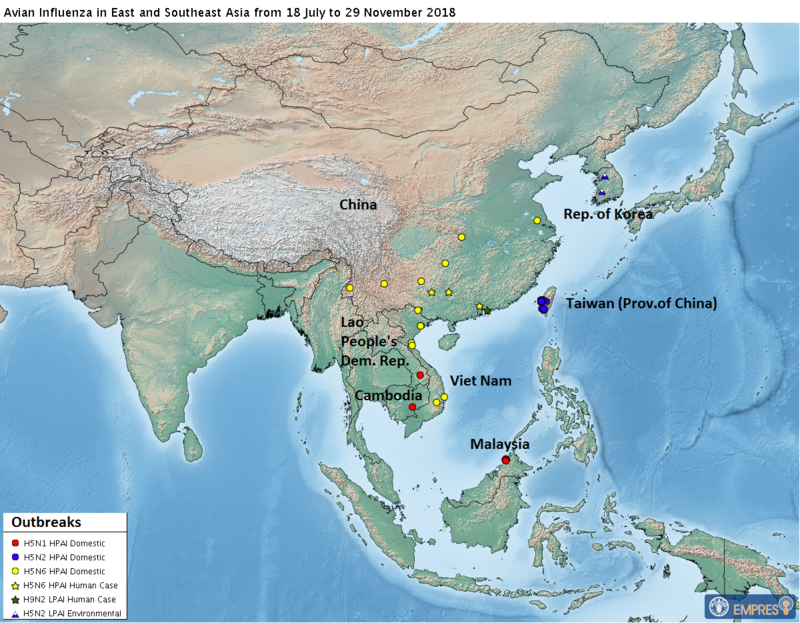 During the period 18 July to 29 November 2018, five different avian influenza virus subtypes have been reported in poultry in South-East Asia, of which three were highly pathogenic (H5N1, H5N2 and H5N6 ) and two low pathogenic (H5N2 and H9N2). H5N1 HPAI caused one poultry outbreak in Cambodia, one in Lao People’s Democratic Republic and seven poultry outbreaks in Malaysia, all in domestic chickens. In Taiwan, Province of China, 14 outbreaks in poultry were confirmed to be caused by H5N2 HPAI affecting a range of domestic species such as chickens, ducks, geese and turkeys. H5N6 HPAI caused seven poultry outbreaks in Viet Nam affecting a range of domestic species including chickens, ducks and geese. In China, six outbreaks in poultry and three human cases were confirmed to be caused H5N6 HPAI and another human case by H9N2 LPAI. In the Rep. of Korea three environmental samples from wild bird faeces tested positive for H5N2 LPAI. Highly pathogenic H5N1, H5N6 and H5N8 viruses have demonstrated the ability to spread also via migratory water birds. However, during the period 18 July to 29 November 2018, no wild bird cases were reported. We consider avian influenza activity to be higher in the period December to March, thus reports of outbreaks in poultry or detections in wild birds and humans are expected to increase over the coming months in the region.